Jio came up with new bang bang offer ; double dhamaka again ! Now you can enjoy a 3GB Data Per day in all plans…Yes ! And You can also grab the Rs. 100 cashback on Jio Plas So for info read this. 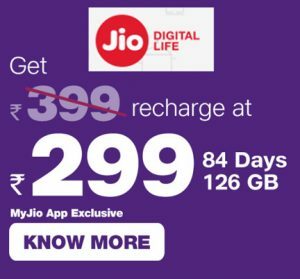 due the competition level Reliance Jio is giving more benefits to jio customers….Now you can enjoy 3 GB Data Per Data per data – 1.5 Data + 1.5 Additional Data ! Reliance Jio also offering ₹50 Instant Cashback on MyJio App and ₹50 Cashback via payment with Phonepe. Login to MyJio app and click on Recharge tab.